The Sacramento region's annual 24-hour fundraising event for nonprofits! Big Day of Giving provides an opportunity for donors to show their appreciation and support for Sacramento, California-area nonprofits like Keep Playing Baseball. We are excited to be participating in Big Day of Giving for the first time in 2019! The Sacramento Regional Community Foundation capacity building program helps local nonprofits like KPB hone their skills in marketing, social media, and board and donor engagement. The program culminates on Thursday, May 2nd with the 24-hour fundraiser and provides an opportunity for KPB users and supporters all over the country step up to the plate to support our organization with a donation (minimum $15). For people who can afford to support our mission and resources, we ask that you consider making a contribution today. Why is it Important I Give on Big Day of Giving? Our goal for our first year of participation is to get as many unique donations of any amount. We hope you'll consider showing your support! Visit KPB's Big Day of Giving profile on GivingEdge HERE and schedule your donation (starting April 15). Each donation (of any amount) that we receive on May 2nd enters KPB into the running for "prize money boosts". These boosts can mean as much as $1,000 added on to your donation, thanks to Western Health Advantage and the Sacramento Regional Community Fund. Keep Playing Baseball doesn't believe in passing the cost of its resources on to players or families. We never want money to dictate who has access to necessary information and resources that they need to make educated and informed decisions in the college search and recruiting process. We want all players to have what they need to play college baseball and earn a college degree. Your donation makes a huge difference in allowing us to improve our free resources and reach more players and families in need of affordable help. Learn about our work and the educational programming that your donation will support in this short video! How Do I Make a Donation to KPB for Big Day of Giving? Scheduled donations for Big Day of Giving start on April 15. To schedule your donation Click HERE. Your donation will be processed on Big Day of Giving (Thursday, May 2nd). To make an online donation to Keep Playing Baseball on Big Day of Giving (Thursday, May 2nd) Click HERE. Come visit our table at Sudwerk Brewery in Davis, CA between 5-9 pm on Big Day of Giving (Thursday, May 2nd) to make your donation in person! We will accept credit cards, checks, and cash at the Bid Day at the Dock event and look forward to seeing you there! If you want to make a donation to Keep Playing Baseball today, you may do so through our website by Clicking HERE. Your donation will be processed immediately. Read below to learn about how to create your own peer-to-peer fundraising campaign for Keep Playing Baseball leading up to Big Day of Giving. You can create your campaign starting on April 8th and start collecting donations on April 15. Peer-to-peer campaigns are a fun way to amplify your impact by joining together with others. How Can I Help if I Can't Afford to Give? We understand that not everyone will be in a position to give. For those wanting to help in addition to or instead of a donation, we ask that you run a peer-to-peer campaign fundraiser for KPB. Step-by-step directions for creating a peer-to-peer campaign for KPB are shown in the pictures below. Please contact Ethan@keepplayingbaseball.org with questions and thank you for your support! 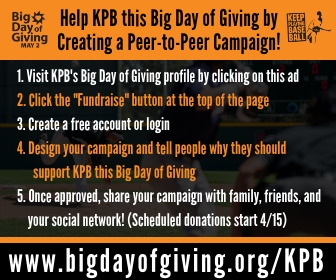 You can help KPB with its fundraising efforts for Big Day of Giving by creating your own campaign to share with friends! The 1-minute video and written instructions below explain exactly how to set it up. 1️⃣ First, visit KPB's Big Day of Giving profile by clicking HERE. 2️⃣ Click the "Fundraise" button at the top of the page. 3️⃣ Log in or create a free account. 5️⃣ Once your campaign is created, it will be sent to us for approval. Once approved, your campaign will be linked to KPB's page and you can leverage your network to help raise money for KPB and youth ballplayers everywhere! Just remember, donations don't start until Monday, April 15th. Get started with your peer-to-peer campaign HERE! Need more help? Click HERE or email us at ethan@keepplayingbaseball.org.